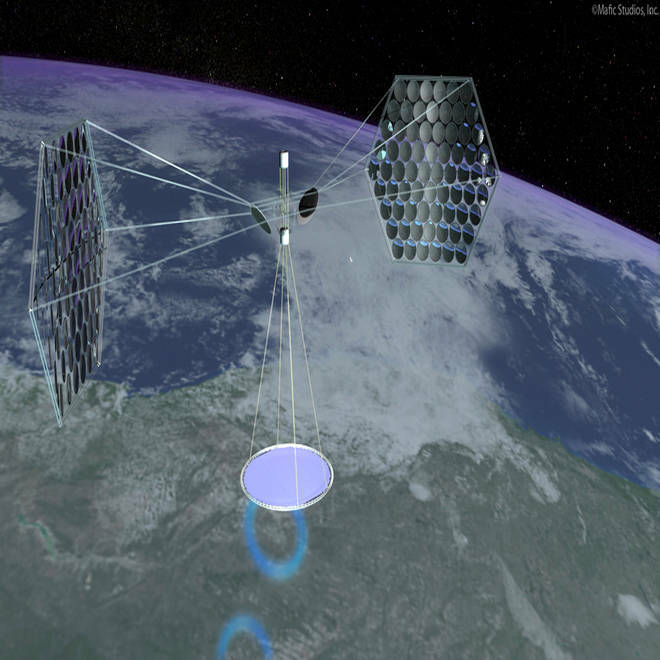 An artist's conception shows a large phased array in orbit, soaking up solar power. NASA is awarding $100,000 one-year grants to 30 teams for out-of-this-world ideas ranging from new kinds of spacesuits to quantum communication and space solar power. The awards were announced today under the auspices of the NASA Innovative Advanced Concepts program, or NIAC. The space agency said the concepts were chosen on the basis of their potential for enhancing future space missions. The grants will go toward further study, to determine whether the ideas could help NASA meet future mission requirements. "These innovative concepts have the potential to mature into the transformative capabilities NASA needs to improve our current space mission operations, seeding the technology breakthroughs needed for the challenging space missions in NASA's future," NASA Chief Technologist Bobby Braun said in today's announcement. The 30 recipients were chosen from hundreds of proposals, Joe Parrish, director for early-stage innovation in NASA's Office of the Chief Technologist, told journalists during a teleconference. The grants will be disbursed starting in September, and the projects will be highlighted at a conference in the spring of 2012, said Jay Falker, NIAC's program executive. Falker said project teams will present papers on their work by the end of the year, and some will even develop hardware. The most promising concepts will be chosen for two-year Phase 2 grants amounting to $500,000 each. "We recognize that in order to achieve big gains, we are going to have to accept some risks," Parrish said. NIAC follows up on an earlier program with the same acronym, known as the NASA Institute for Advanced Concepts. Between 1998 and 2007, that program pioneered such concepts as space solar power and the space elevator, but it was retooled in response to recommendations from the National Research Council. Unlike the previous NIAC, the new NIAC is open to NASA centers as well as outside academic and industry teams. "I'm just so thrilled that NIAC is back," Parrish said. NIAC is just one part of NASA's technology development program, which also offers larger grants for more mature technologies as well as Centennial Challenge prizes that are open to all comers. Variable Vector Countermeasure Suit (V2Suit) for Space Habitation and Exploration, Draper Laboratory, Kevin Duda. NASA says this spacesuit would use flywheels to stabilize and assist astronauts as they work in microgravity. Enabling All-Access Mobility for Planetary Exploration Vehicles via Transformative Reconfiguration, North Carolina State University, Scott Ferguson. The Potential for Ambient Plasma Wave Propulsion, Ohio Aerospace Institute, James Gilland. Space Debris Elimination (SpaDE), Raytheon BBN Technologies, Daniel Gregory. NASA's Falker said this project would look into the possibility of using a balloon-lofted, high-altitude air gun to change the course of potentially hazardous orbital debris. Regolith-Derived Heat Shield for a Planetary Body Entry and Descent System with In-Situ Fabrication, NASA Kennedy Space Center, Michael Hogue. Atmospheric Breathing Electric Thruster for Planetary Exploration, Busek Co. Inc., Kurt Hohman. Economical Radioisotope Power, Universities Space Research Association, Steven Howe. Contour Crafting Simulation Plan for Lunar Settlement Infrastructure Build-Up, University of Southern California, Behrokh Khoshnevis. Entanglement-assisted Communication System for NASA's Deep-Space Missions: Feasibility Test and Conceptual Design, University of Illinois at Urbana-Champaign, Paul Kwiat. This project proposes using quantum entanglement to create more capable communication systems in space. SPS-ALPHA: The First Practical Solar Power Satellite via Arbitrarily Large PHased Array, Artemis Innovation Management Solutions, John Mankins. This study could lead to a demonstration project for space-based solar power satellites. High-temperature superconductors as electromagnetic deployment and support structures in spacecraft, Massachusetts Institute of Technology, David Miller. Non-Radioisotope Power Systems For Sunless Solar System Exploration Missions, Pennsylvania State University, Michael Paul. Spacecraft/Rover Hybrids for the Exploration of Small Solar System Bodies, NASA Jet Propulsion Laboratory, Marco Pavone. Ultra-Light “Photonic Muscle” Space Structures, University of Hawaii, Joe Ritter. This project could lead to the development of telescopes and other space-based structures whose shapes can be altered by light beams. Low-Power Microrobotics Utilizing Biologically Inspired Energy Generation, Naval Research Laboratory, Gregory Scott. This study would focus on adapting biological models for space robots. Printable Spacecraft, NASA Jet Propulsion Laboratory, Kendra Short. This project would look into using 3-D printing technology to create small spacecraft or components for a planetary outpost. In-Space Propulsion Engine Architecture based on Sublimation of Planetary Resources: from exploration robots to NEO mitigation, NASA Kennedy Space Center, Laurent Sibille. Metallic Hydrogen: A Game-Changing Rocket Propellant, Harvard University, Isaac Silvera. Nuclear Propulsion through Direct Conversion of Fusion Energy, MSNW LLC, John Slough. Interplanetary CubeSats: Opening the Solar System to a Broad Community at Lower Cost, NASA Jet Propulsion Laboratory, Robert Staehle. Ghost Imaging of Space Objects, NASA Jet Propulsion, Dmitry Strekalov. NASA says this technology culd eventually be applied to observations of extrasolar planets or black holes. Laser-Based Optical Trap for Remote Sampling of Interplanetary and Atmospheric Particulate Matter, NASA Goddard Space Flight Center, Paul Stysley. Steering of Solar Sails Using Optical Lift Force, Rochester Institute of Technology, Grover Swartzlander. Aneutronic Fusion Spacecraft Architecture, University of Houston at Clear Lake, Alfonso Tarditi. Radiation Shielding Materials Containing Hydrogen, Boron, and Nitrogen: Systematic Computational and Experimental Study, NASA Langley Research Center, Sheila Thibeault. Meeting the Grand Challenge of Protecting Astronaut's Health: Electrostatic Active Space Radiation Shielding for Deep Space Missions, NASA Langley Research Center, Ram Tripathi. Proposal for a Concept Assessment of a Fission Fragment Rocket Engine (FFRE) Propelled Spacecraft, NASA Marshall Space Flight Center, Robert Werka. Radiation Protection and Architecture Utilizing High Temperature Superconducting Magnets, NASA Johnson Space Center, Shayne Westover. Technologies Enabling Exploration of Skylights, Lava Tubes and Caves, Astrobotic Technology Inc., William Whittaker. The Google Lunar X Prize entrant has long talked about using caves on the moon as low-cost shelters for rovers and astronauts.